Many of us know swapping out protein sources like red meat for fish can be beneficial to our health. But when choosing between farm-raised and wild-caught fish, some may wonder: Are all fish created equal? To find out more about how where your fish comes from can affect our health, we spoke with Dana Hunnes, a senior dietitian at Ronald Reagan UCLA Medical Center and an adjunct assistant professor at the UCLA Fielding School of Public Health. 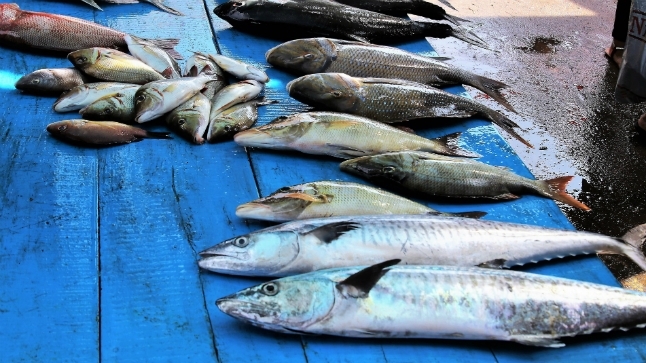 Are wild-caught fish healthier for us than the farm-raised variety? When we think of the health benefits of fish, one of the first nutrients that comes to mind is omega-3 fatty acids. In that regard, wild-caught fish tend to be healthier; they often have higher levels of omega-3s compared to farmed fish. But omega-3s are only one component of the health quality of fish. One of the biggest concerns with farm-raised fish is its potential to contain industrial chemicals, including terephthalic acid (TPA) and polyvinyl chloride (PVC). Fish raised in farms may also contain chemicals used to "improve" their coloring (e.g. the salmon you buy that appears ultra-pink), which could have an impact on our health. Because of the conditions in which most farmed fish are raised, microbial contamination of their habitat could also pose a health threat to us and to wild populations of fish, which we have seen in wild- and farmed-salmon populations in the Pacific Northwest. And then there's the question of the antibiotics. Just as there are health concerns over antibiotics used in livestock, such as chickens and cattle, farmed-raised fish also are fed antibiotics, which we ingest when we consume fish. What makes farm-raised fish different from wild-caught? Wild-caught fish have the freedom to roam in the water and eat any prey they want. Farmed fish, on the other hand, do not live a "natural" life. Farmed fish are generally "grown" as monocultures – or a single species of fish. Depending on the species of fish, they may be reared within a huge netted system in the ocean, in a fjord, or even in a freshwater pond. Most farmed fish are grown in nets that are overcrowded, which can pose problems. The population can become infested with sea lice, or other microbes, due to their congested living conditions. Diseases can spread more easily in a population of a singular species of fish. Farmed fish are typically fed an unvaried diet – usually, a fish feed or fish pellets that contain ingredients like wild fish, certain nutrients, coloring, and even antibiotics. Are some types of fish healthier than others? The Monterey Bay Aquarium's Seafood Watch website is a good tool for determining whether certain species of fish are healthier and more sustainable. They recommend eating farmed salmon, for example, no more than once or twice a month. Some of their recommendations have to do with the potentially toxic chemicals that get absorbed by these fish in the food they are fed; or for wild fish, by the prey they eat. Recent studies have shown that the so-called Pacific Garbage Patch in the north Pacific Ocean is more than twice the size of France, containing a giant mass of marine debris, including hundreds of millions of pieces of plastic. Wild fish have been found with plastic in their digestive systems, and many of the chemicals in plastic get absorbed into their fat. This can also be toxic to us. What are other ways we can get omega-3 fatty acids? I opt for plant-based sources of omega-3s. Omega-3s come in the form of alpha linolenic acid (ALA), docosahexaenoic acid (DHA), and eicosapentaenoic acid (EPA) – all of which are important for us. Chia seeds, walnuts, olive oil, and other foods contain solid amounts of ALA, which our body can convert into DHA and EPA. Algae, algae oil, and other supplements can help provide more sufficient amounts of DHA and EPA. I explain more about omega-3s, government recommendations on intake, and supplements in an article on SELF.com. Should we stop eating farmed fish? We are in the middle of an experiment. We don’t know yet the extent of the negative effects of eating traditionally farmed fish, as described above. From a sustainability standpoint, farmed fish pose some threats to the environment, and it's unlikely we can keep up these farmed-fishing methods. However, there are certain closed aquatic systems where the fish are fed a vegetarian diet that may be able to provide sustainable and safe fish for human consumption. The answer to this question also depends on where you live. In some countries, people absolutely depend on fish – especially wild-caught fish – to meet their daily protein needs. But in the United States, most of us don't have a problem getting enough protein in our diet, and instead are eating fish by choice.